This could have been called "when Nicolas met Carla", this could have been a romantic comedy starring Meg Ryan and Billy Cristal but it's not. It's called "Autobiographie non autorisée" ("Unauthorized Autobiography").Written by the advertiser Jacques Séguéla, it's about the love story of the French President and his wife. Fancy a touch of romance in the cruel world of politics? Everybody knows that the romance between former model and singer Carla Bruni and President Nicolas Sarkozy has been speedy, but who could imagine he spoke about marriage and children on their first encounter? Who could imagine he asked her to be the Marilyn Monroe to his JFK? 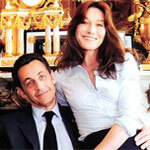 Both fell under each other's spell, but Nicolas Sarkozy confessed he would not be a gift. Indeed, he is always followed by paparazzi. Carla Bruni laughed out loud: “When it comes to the celebrity press, you are an amateur. My encounter with Mick [Jagger] stayed secret for eight years. We passed through all the capitals of the world and no photographer ever caught us.” The only response she could get was: “How could you have stayed eight years with a man who has such ridiculous calves?” Deuce, one all! Things quickly accelerated Nicolas Sarkozy acted as a magnet attracted by Carla Bruni and other guests were simply bemused. And yet, so far, they didn’t see anything. When Sarkozy promised her he would come to her forthcoming concert, they should have been more surprised. And then.. “We will announce our engagement. You will see, we will do better than Marilyn and Kennedy,” he told her. She replied: “Engagement, never! From now on I will only live with a man who gives me a child.” Mr Sarkozy came back: “I have already brought up five. Why not six?” Marriage, children, Carla Bruni at least refused a kiss. The President whispered in Ms Bruni's ear: “Bet you don't have the nerve right now in front of everyone to kiss me on the mouth.” This time, she did not reply but accepted to let him bring her back home… and call her friend Séguéla on the phone 10 minutes later saying: “Your chum - what charm, what intelligence, what attention, what energy, what seductiveness. But I find him a bit of a boor. I left him my number and he still hasn't called.” Well, I’m sure she did not wait that long given that seven weeks later, they were married. I just wanted to reassure her: this is not the regular way of seducing in France and most of the stories begin in a much more classical way. In passing, isn’t it too beautiful to be totally true? Love at first sight at the head of France… fact or fiction? I can’t help thinking this has been a little romanticised... What do you think? Goes to show the power of viral ads. Lots of talk about brand utiliy' but people are still people and still want to be entertained (by traditional, creative ads). I think it is very possible and is not something that has been a little romanticised. The same thing happened to me many years ago when I was around the same age! I had loved my man in a past life - this much was obvious when we first met. I would expect the same thing happened between Carla Bruni and the President. True love cannot die!